Similarly, both rely on glass as a primary material. Yet their work looks strikingly different. Helen Lee’s sharply intellectual hot glass pieces are minimalist in appearance: clean cut with restrained, precise shapes and colors. Anne Kingsbury’s glass beadwork, on the other hand, is exuberant and ludic, with a visual witticism that dazzles the eye. This difference in visual flavor can be traced back to the way each artist operates in the studio. Lee tends to approach projects conceptually, starting with an idea and working with the characteristics of her materials accordingly. Kingsbury’s ideas emerge from her work as she’s making it, with the artistic process of making and remaking one piece sometimes taking years or even decades. Yet both artists explore the theme of language in their own way. 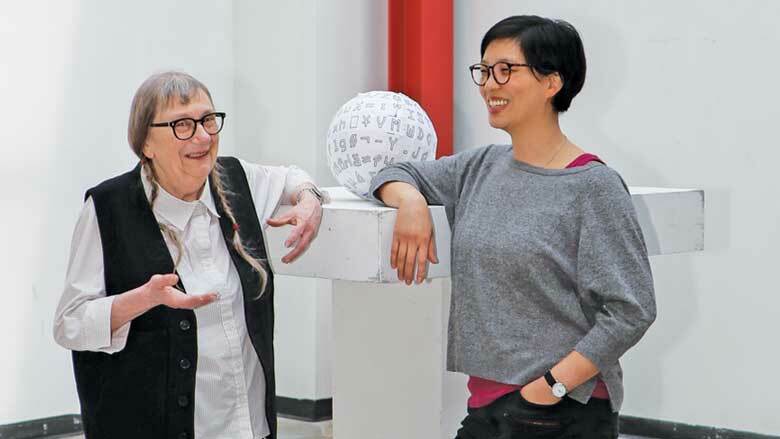 Helen Lee’s understanding of language is deeply rooted in her upbringing. Currently an Assistant Professor of Glass at the University of Wisconsin–Madison, Lee grew up in two worlds: one that she shared with her maternal grandmother from China, who raised her, and another that surrounded her whenever she left home. At home, Lee spoke Chinese and was immersed in the symbols and ways of her elder; everywhere else, she was just another American girl speaking English with friends and teachers. “Growing up, I had to do a lot of translation work for my grandmother, who only spoke Chinese in America,” recalls Lee. She compares the work of translation to the act of pouring water from one vessel into another, differently shaped vessel; the result is never quite the same, and the process tends to be messy. The necessity for this translation work disappeared with the passing of her grandmother, but the habit stayed. Lee’s acute awareness of language lies at the core of her work as a visual artist. She’s fascinated by the “lost spaces where one language doesn’t overlap with the map of another” and the slippages, chance encounters, and unintentional consequences that result from the collision of different linguistic realms. Lee first encountered her medium of choice during high school, in an art summer camp that featured a glass lab. The attraction was instant. “Hot glass resides within such a mysterious state of matter; it moves like honey, but at a much bigger scale. Watching hot glass, we just can’t believe that it moves the way it does. It’s completely non-intuitive—and that’s what fascinates me,” she says. One of the pieces Lee made during graduate school, A E I O U, consists of five glass vessels that each produce the sound of a vowel when blown into with the help of a reed. With this and other pieces, Lee hopes to draw attention to moments of transition between body, language, breath, and glass. She likens transitions such as these to the zones of intense tumult one finds on a beach or other area between land and sea. One of Lee’s pieces called Alphabit explores our culture’s physical memory of language. Crafted from the same material as smartphone screens and fiber-optic cables, Alphabit consists of five transparent glass trays divided into compartments that hold small, translucent glass tiles. The tiles contain one black letter or symbol that corresponds to the letters on the standard QWERTY keyboard. Reminiscent of vintage letterpress drawers, the trays are nearly identical to each other, with the only difference being that the glass tiles get smaller with each tray—each set of symbols descending in both physical as well as font size. The piece points to similarities between digital vector graphics, which allow for character re-sizing without any loss of fidelity, and a technique called murrine in which stretched hot glass retains internal characteristics. Alphabit also references material elements of typography, such as the keyboard, which has made a successful transition into the digital age, and the letterpress type case, which has not. Anne Kingsbury is a visual artist, poetry advocate, and community activist who, together with husband Karl Gartung, founded the nonprofit Woodland Pattern Book Center in 1979 in Milwaukee’s Riverwest neighborhood. Woodland Pattern offers an eclectic selection of small press publications as well as visual art exhibitions, poetry readings, writing workshops, and youth programs dedicated to the literary arts. “Woodland Pattern, for me, is a form of education”, says Kingsbury. “It’s a place where I encounter books, artists, writers, and ideas—I absorb it all.” Woodland Pattern offers the largest selection of small press poetry for sale in the United States; its reputation as a hub for poets and writers extends nationally. Simply put, the books one can find at Woodland Pattern are hard to find anywhere else, but Kingsbury makes them visible and available—and that’s the point. Elevating the things that otherwise remain unnoticed is central to everything that Anne Kingsbury does, in life as in art. Since the 1970s, Kingsbury’s artwork has evolved from large-scale woodblock prints to mixed media figurative work, and, more recently, to intricately beaded pieces. Above all, her work is firmly rooted in the daily rituals and encounters of life. For decades, Kingsbury has kept a journal that records the most ordinary events, as well as the time they take to complete (e.g. “Wash face and hair: ten minutes.”). More significant events are listed in the journal as well, but they are made no more important than any other. Drawings exist alongside words—two orders of representation weaving into each other. Anne Kingsbury is curious about it all. The glass beads she uses in her work are instrumental to this process. “The beads are like pixels,” says Kingsbury. “There’s a limit to how small I can go, but they also offer resistance. They slow me down and force me to spend time making things by hand.” Her main attraction to the material of beads lies in the core characteristics of handiwork and time. Kingsbury’s rejection of our contemporary obsession with efficiency and speed is quietly subversive. The meticulous nature of Kingsbury’s work is balanced with a distinct playfulness. She is loosely inspired by Pataphysics, a Dadaist play on philosophy that grants permission to combine the known with the unknown and the serious with the whimsical to create nonsensical orders, absurd symbols, and paradoxical narratives. In this spirit, Kingsbury takes liberties with letters, infusing them with an eccentric spirit. In Beaded Pataphyiscal Alphabet, one encounters a painstakingly rendered letter K in tiny, colorful beads, and discovers that this familiar symbol has been transfigured into an elegant man with two standing legs, flying scarf, and extravagant hat. There is no logical link between the idea of the letter K and that of an elegant man, and that logical gap is where the pataphysical playfulness resides. Similarly, Kingsbury’s letter G is a deity that seems to have sprung from the carvings of an Aztec temple, with colorful marks on the cheeks and the tongue sticking out in a powerful and irreverent gesture. “I don’t plan out my pieces, Kingsbury says. “I learn from the work as I make it.” To work this way, an artist must learn to let go of control and to be open to the unexpected: “One learns to tell the difference between a gift from God and a disaster,” she jokes. During her exhibition at the James Watrous Gallery, Kingsbury will invite viewers to witness her artistic process through live beading demonstrations. Gallery visitors will also encounter her sketches as well as intricately beaded renderings and journal pages alongside artwork. Finished or unfinished: the distinction is irrelevant to Kingsbury’s work, as her life and her art evolve as one. For her, this evolution carries the most meaning. The side-by-side exhibitions of Helen Lee’s and Anne Kingsbury’s work at the James Watrous Gallery should make for a satisfying show, as there are additional congruities between their work besides language and material. Both artists are, in their own way, dedicated to the historical and the archival: the mundane events of Kingsbury’s journals constitute their own, unorthodox archive, while Lee’s interpretations of the physical and material memory of language reveal a distinctive historical attitude. Those similarities stand in fruitful tension with the divergent ways in which these two artists work in the studio, a fact that will be integral to the contrasting characters of their respective exhibitions. To see their work together is to witness proof that there is no limit to what one can do with art. Dominique Haller was born and raised in Switzerland. She immigrated to the United States in 2009, and graduated from UW–Madison with an MFA in 2014. Her artwork and documentary films have been shown in galleries and film festivals in Switzerland, Portugal, Chicago, New York, and Madison, where she currently lives.